My local library did a Million Pillowcases for Charity drive as part of the drive that the America Red Cross was doing. I decided that I wanted to participate and made two standard size pillowcases. I took the pillowcases to the library on a Saturday and on Monday they posted a picture on their Facebook page showing that my pillowcases were on display behind the front desk. The funny part, I didn’t notice that they were both there until today. I followed this tutorial just like I did for the travel size pillowcase. I still really like the look that the accent fabric gives to the pillowcase. I ended up making one of them shorter than the tutorial because I felt like there was too much extra fabric when on the pillow. So instead of cutting the main fabric 27” I cut it 25”. It still fits on the pillow, but there isn’t as much extra fabric. For the blue pillowcase I used Farm Friends by Jamie Wood for Clothworks Fabrics and the other one is Stitch Organic by Betz White for Robert Kaufman Fabrics. I purchased all of the fabric from Fat Quarter Shop. 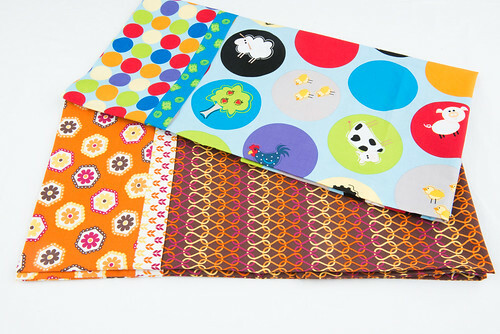 I think I have mentioned Fat Quarter Shop before and how quickly they ship. If you order before 3pm and your order qualifies, they will ship the same day. 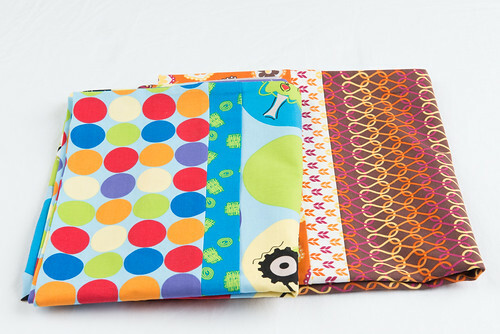 Then, in just a few days (depending on where you live) you will have new fabric. I usually get my order in 2 days. I highly recommend checking out their shop. Thanks for the tute link:-) My kids could do with some funky new pillow slips. Those pillowcases are so cute! You did an awesome job, can totally see why the library had them on display!